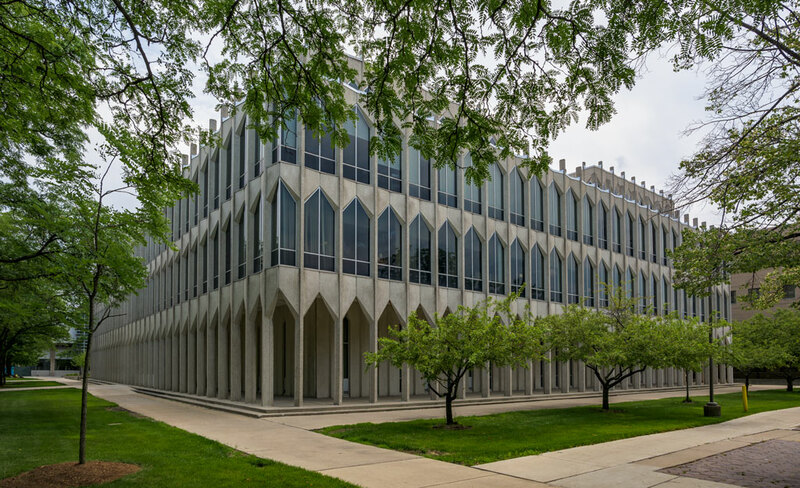 The College of Education Building, constructed in 1960, is the second of four buildings that Minoru Yamasaki designed for the Wayne State campus. Located directly across Gullen Mall from the MacGregor Memorial Conference Center, the striking four-story white concrete structure is set on a platform and features narrow, pointed windows on all four sides of the building. These deeply inset windows are similar to those found on the Prentis Building , another Yamasaki-designed building on the WSU campus. The top three floors of the building overhang a walk-around supported by 120 precast concrete pillars, each 42 feet high. Designed with purpose of uniting the burgeoning College of Education -once spread across campus in different buildings – the building houses both offices and classrooms. A significant feature of the building is the center core of “windowless” classrooms, designed with the intent of eliminating all outside distractions for students and providing functional space for the use of state-of-the-art audio/visual teaching aids. It is a clear example of Yamasaki’s vision for the campus: an urban university free from the distractions” of the city. Hailed by one local newspaper as a “…bright oasis in the center of the city,” construction of the building cost approximately $2 million. Designed with purpose of uniting the burgeoning College of Education -once spread across campus in different buildings – the building houses both offices and classrooms.